It's beginning to feel like Christmas around here, finally! We went up to the mountains two weeks ago and cut our own tree, but we were storing it in the garage until last weekend when we finally made room in the living room to put it up. We had to rearrange my daughter's play area, and bring in a table so we could keep our little tree out of reach of curious hands! My parents first introduced us to cutting your own tree a few years ago during the first Christmas after we moved back to Colorado from Tokyo. You get a permit from the Forest Service and go to an assigned area in the mountains to pick your own tree. It's really fun to meet up at the Ranger station first, where they serve hot cider and cookies, and then pile into the truck and head up the road. My family has always seemed to go for the spindly, orphan-looking, Charlie Brown-esque trees, even when we used to buy them from tree lots. There's an added charm, though, when driving past stands of tall, full, proud trees, and someone inevitably thrusts their arm out the window and exclaims "Over there! That one is totally the Charlie Brown Christmas tree!" So my husband and I have sort of adopted the tradition, and love picking out a little straggler to take home and spit-shine with our folksy ornaments. We still haven't found a topper we like, so we've gone bare the past couple of years. Oh, and since taking the picture of the tree, we lost the maroon glass ball to a freak accident involving the window blinds. Oops! And the bebe really got excited when I unpacked the mini tinsel tree, grabbing it from me then running all around the house like a little Christmas ambassador. I finally caught up with her in the kitchen and, thanks to the magic of Dr. Seuss, I managed to trade her one "Hop On Pop" for one silver tree. The tree is now safely parked on a high shelf, where she can admire it from afar. My bad. 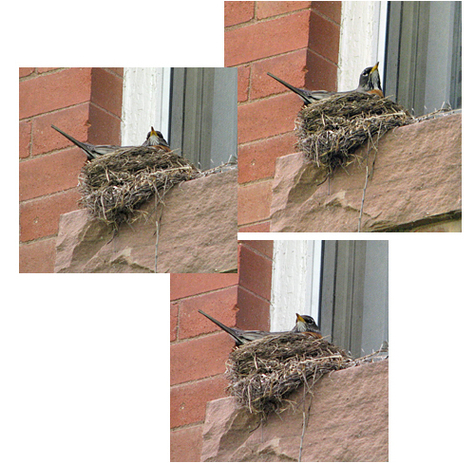 While I've been taking tons of pictures and video of the bird family, I haven't been very good about updating my blog with them, now, have I? So, here is a huge update, spanning almost a week (you can find even more pictures here). In summary: the babies have been growing like wildfire. Maybe that's because of their protein-rich diet, which seems to be nearly constant. 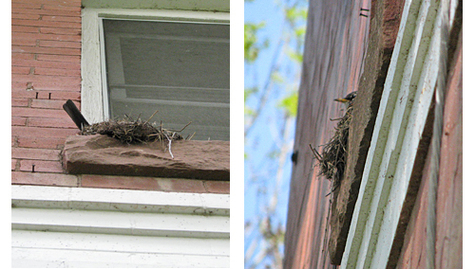 And if mom (or dad) steps away for even one minute, they're watching like little hawks. But when they have a little down time (i.e. not eating worms), they take turns stretching (that little nest is getting cramped! 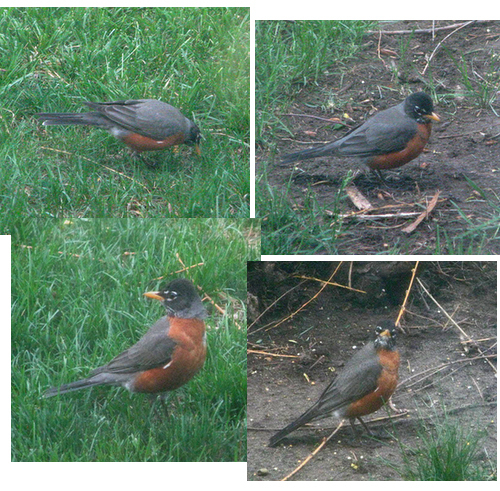 ), cleaning themselves, and practicing flapping their wings. It's all incredibly cute. 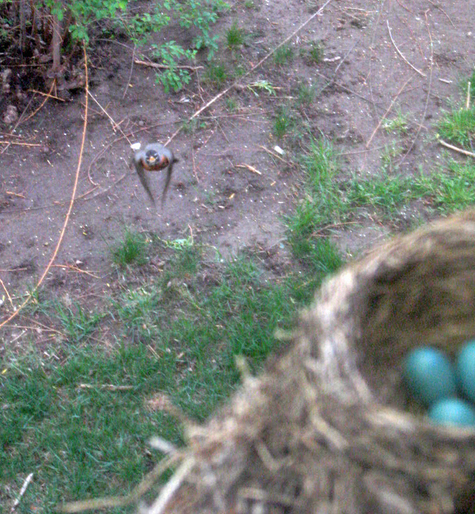 I think any day now they're going to try to fly. I'll do my best to get some shots for you. Enjoy! Did you see this article in the New York Times last week? I just discovered it myself, and it addresses something we've been working on for awhile now: reducing the food that is thrown out (wasted) in our household. At some point we realized that it was just ridiculous, and embarrassing, to be throwing out food that we had let languish in the fridge until it was no longer edible. Either because we forgot about it, or didn't "feel" like eating it that night, or whatever. I'm sure you all have been there at one time or another. It seems almost a given in the food-rich environment in which most of us live. Buying nifty storage containers, so we're motivated to use them. Never buying a loaf of bread until the last loaf of bread has been completely eaten. And, by association, only buying those little hoagie-size loaves of French bread (if they're available, which often they're not) when we need French bread to complete a meal. No more buying the full size loaves that you can only eat a piece or two of before the proverbial midnight, when the rest of it turns into a loaf of French cement. Ironically, in one area, I've found that making more actually leads to less waste. When we prepare rice, it's in a rice cooker (natch). So I found that if I tried to make exactly enough for one meal, I'd always overshoot by just a little. The result was that I'd have too little rice to save, but enough that throwing it out felt wasteful. So instead, now I make more rice each time, in the neighborhood of 1 to 2 cups total (after cooking). This leaves enough leftover that it is worth saving. We reheat it and use it in another meal, where it gets finished off (I know this is probably sacrilegious to those who live in rice-based cultures (Japan), where freshness is held at a premium. But I'll address these sorts of bad-Westerner habits of mine in another post I intend to write, scheduled to be called Bad Gaijin). With just these changes, I'm proud to say we now almost never throw away uneaten or rotten food. Of course we can't be perfect, and things escape our notice from time to time (like that shriveled half an onion in a soggy baggie I threw out yesterday). But all in all I think we're doing good. Really, awareness is the first step. As usual. 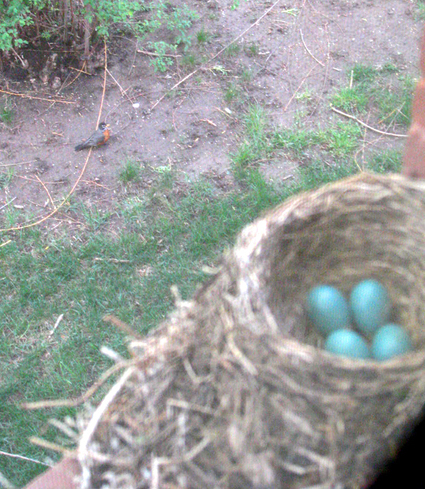 I am pleased to announce that all of the chicks have hatched, and mom and babies are doing well. 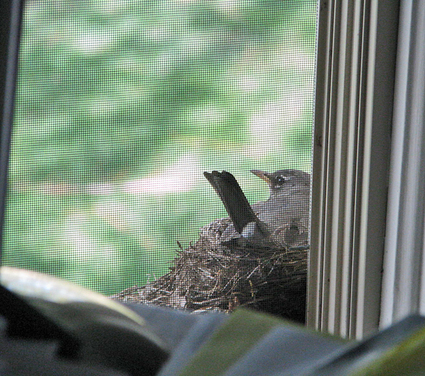 The second and third hatched yesterday, and the fourth appeared sometime before we woke up this morning. I don't have a picture of the four of them together yet, as mom has been busy keeping them warm this cool and rainy day. BUT...I did manage to get some nifty video of mom and...mom? (I'll post more on this later)...feeding their hungry mouths. Enjoy! ...The firstborn chick! Isn't that the cutest red blob you've ever seen?! And mom couldn't be more proud. ...her boredom occasionally punctuated by watching dad chase squirrels in the tree across from her nest. He dive bombs them to get them down out of the branches, then follows them on the ground for a little bit, to make sure they get far, far away from their little brood. Just a few more days to go, I think, before the babies arrive. Can't wait! Well, my suspicion was confirmed. 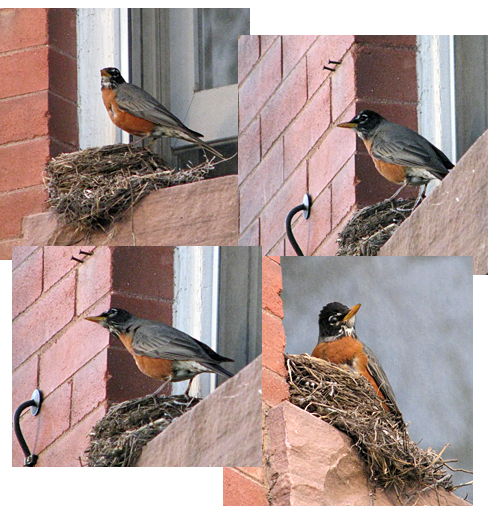 I'm not a bird expert or anything, but I could have sworn there was a "boy" robin and a "girl" robin taking care of those 4 eggs. And here it is. Proof. Wanna see? (Oh, and the baby noises you hear are, um, my baby. Making noise). Update from last night (May 11). Coming back from a walk at dusk, we spotted what I think is the daddy! (Any bird experts out there who can tell the difference?) 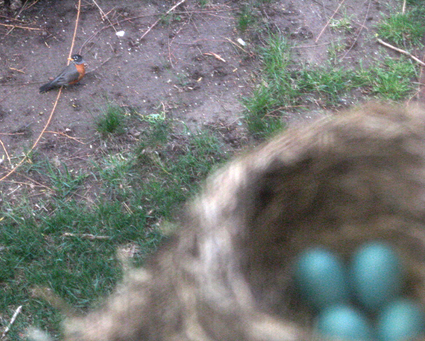 He was in the nest. 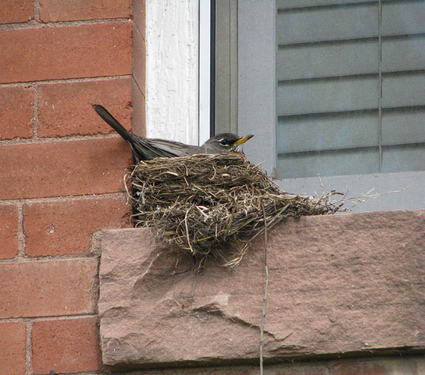 Well, more like on the nest. 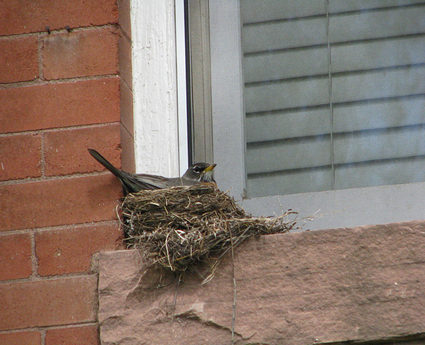 Actually, he was on the edge of the nest, looking intently at something. 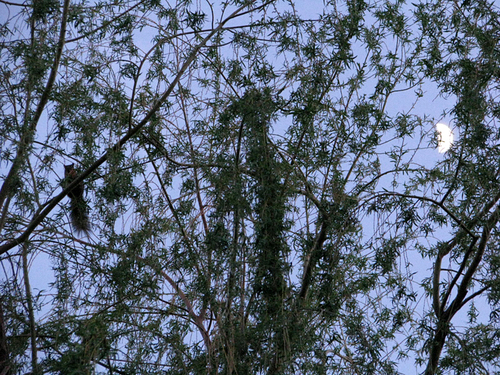 We looked up at the willow tree next to our house and saw...an owl. Horrors! It was somewhat smallish, with mottled gray coloring. 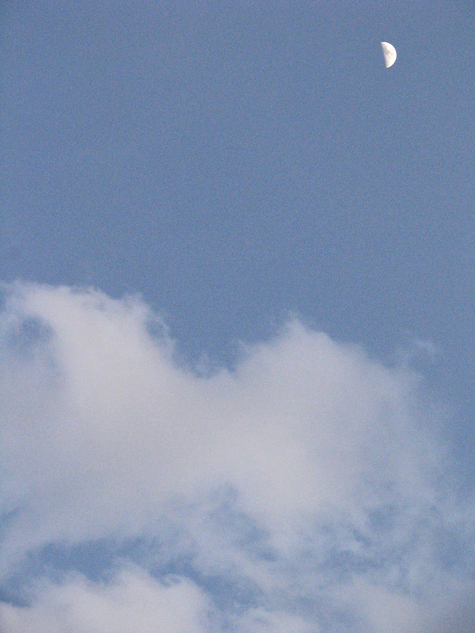 Unfortunately, it flew off just as I came back out of the house with the camera. 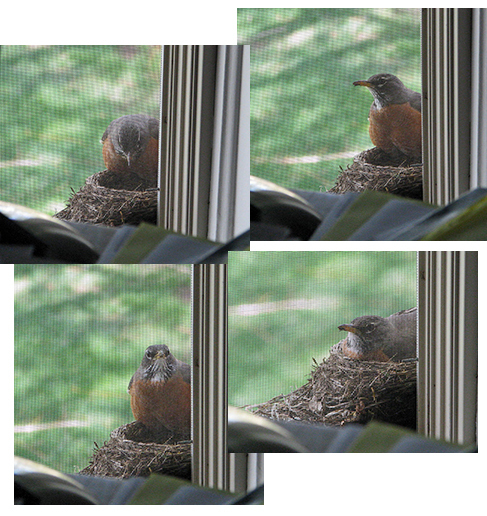 The dad robin flew off after it, and mom came back to the nest and resumed her post. 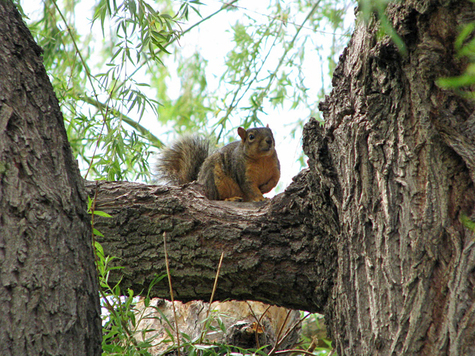 Later, we came back out to see if the owl had returned, and spotted a squirrel hiding in the branches. I think normally squirrels would be a threat to the eggs, but I don't think they'll be able to jump the gap between the tree branches and our house. 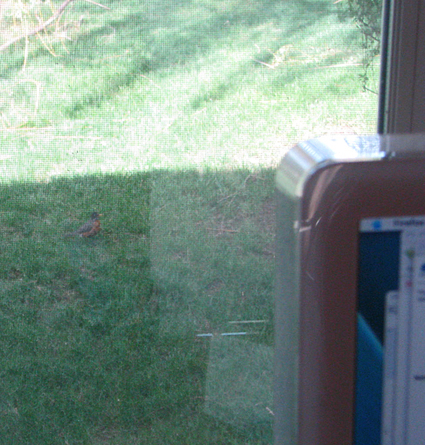 But that owl...that could be bad for our little robin family. We're keeping an eye out. And our fingers crossed. And then she saw me. Ack! I backed up slowly to the other side of the room, as far away from the window as possible. 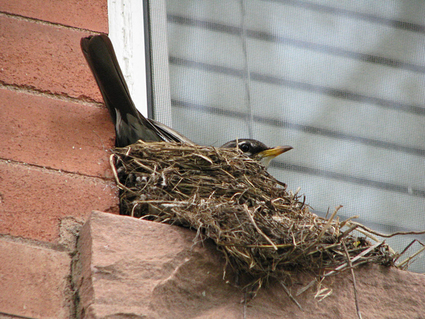 She came back to the nest and checked to see if her little brood was alright. I guess she decided they were okay, and I wasn't a threat, because she settled back in for another day of waiting. Sorry for making you worry, little bird. I hope you enjoy the rest of your day. And you too, all you moms and moms-to-be out there. Happy Mother's Day!